Don't you just love it when you're stumped on how to make/create something and when you find the perfect sketch; everything just falls into place?!! That's how I feel about this card & sketch everyone. I was at a total loss when it came to creating my cards for a demo group swap that I participate in.....thank goodness I remembered this blog---Card Sketch A Day---and I was sooo elated when the page opened and there was *my sketch* I instantly knew what I was going to do and set out to get these babies done!! I used Just Buzzin' By--courtesy of my friend/downline Teresa...thank you!!! I also used my eyelet border & heart to heart punches along with my scalloped edge punch. 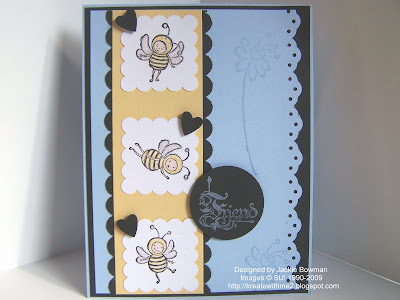 I wasn't sure which sentiment to use with these cute lil' bees---I know, I'm lazy and wanted to use a punch instead of stamping and cutting out the sentiment that came with the set--so I just used one from the level 2 hostess set A Little Somethin'. I added some glitter to my bees & *looked* for a space to put ribbon---love that stuff and I like to use it on all my cards. This layout didn't *gel* with ribbon though so I reluctantly left it off. I think my card is still cute and I hope the ladies like them also!! Well, I have some running to do today & I'm going to get my hair done! I've been looking forward to this for quite a while----some me time!!! Thanks so much for stopping by and have a great rest of the day! I love it. The colors, the layout, the whole shebang! I even like that stamp set you used! Have a wonderful day & enjoy your "me" time! This is so cute, Jackie! You are right, you found the perfect sketch for your card! Hope you enjoyed your pampering at your hair appointment! Those little bees are so cute, what a great card! Jackie this is adorable. I keep telling myself to do more sketch challenges but somehow it just doesn't happen. Thanks for reminding me just what I'm missing. Very cute - I love the added touch of the hearts. So darling Jackie!! The colors are really pretty with this!! :) TFS! You used one of my favorite color schemes---light blue and black! And you did it justice, too! Cute card. Those bee's are so cute!! Love your card!! Aw, I think this is adorable and wonderfully done! I love the Beeples! So sweet and the layout is perfect for them. Those are some cute little bees! Great card and great layout! This is beautifully done Jackie!! The bees are so cute! Sooo adorable, Jackie...this is such a wonderful sketch and those little bees are just too, too cute!!!! What a cute card! I absolutely love this new stamp set! Very cute, I like this card. Nice Work Jackie! Love the glitter and that cute stamp set. Love the little bees! Cute card. I like the color combo. I love how you combined the 2 sets Jackie. I have the hostess set but not the bees one. You are making me want that side punch now too! This is an awesome spring card!! I love those bees!! The colors are so bright and cheery!! Your card is Bee-utiful! Hope your son is doing okay after his surgery!